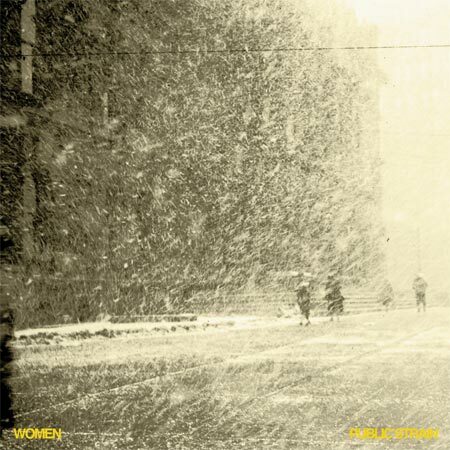 The opening track to Public Strain, the sophomore release from the Alberta, Canada band WOMEN, may sound like it is straight out of a slasher film, but there is nothing frightening about this band. Instead of pounding beats that could lead up to a blood-gushing scene, the song “Can’t You See,” creates the tension of a desolate night with intricate distortion and calming vocals, in tune with sophisticated thrillers like those directed by Christopher Nolan. Much like Nolan’s films, especially this summer’s Inception, WOMEN plays with the idea of reality and mazes, making the listener fall into a dream-like state. Yes, the vocals are ghostly, but underneath that, there is beauty and complex guitarwork. Hearing this album may put listeners in a haze, but it’s all part of the experience. WOMEN shows its ability to editorialize on this album. There is not as much clatter as there was on the band’s 2008 self-titled debut. The group shows restraint and good judgment as to where in a song it is appropriate to add fuzzy elements. For example, “Penal Colony” is a track that begins with melancholy vocals, a straight-forward guitar strum, and steady kick drum. There is some fogginess in the background, but the noise moves so harmoniously with the rest of the song that it is hardly noticeable. Rather than the noise weaving through the song and feeling like an annoyance, it adds warmth and it is not until the tail end of the song that the static grows and becomes solitary feedback. There are a handful of tracks where the commotion is more apparent, and the group shines there as well. “Heat Distraction” and “China Steps” are livelier tracks with grating dissonance. The vocals remain muffled, but the guitar parts are interesting to follow. The obscure guitar playing stirs up psychedelic images of strings that are out of control as they are pulled and released, while their vibrations are magnified. In that same manner, the instrumental layers on “Locust Valley” create a maze that takes listeners on a journey through lush scenery. There are moments in the song where it drops down to a simple strum and the listener is whipped out of a dream state, but there are still hints of awe. While there are some dark moods found in “Cant You See” and “Bells” — an instrumental track resembling a dark church hymn — the album leaves of on a nice bright note. “Eyesore” is a folky beach tune with amiable vocals and a sweet melody. The song leaves a cozy feeling, but it is still undeniable that the journey to feeling comfortable with WOMEN’s sound was a long and perplexing trek. The band’s music is comparable to other groups such as Thee Oh Sees, Wavves, and Vivian Girls, but WOMEN go deeper into a listener’s head. The music seeps into more inner thoughts and turmoil, which will eventually leave a satisfactory feeling, but may be harder to appreciate.